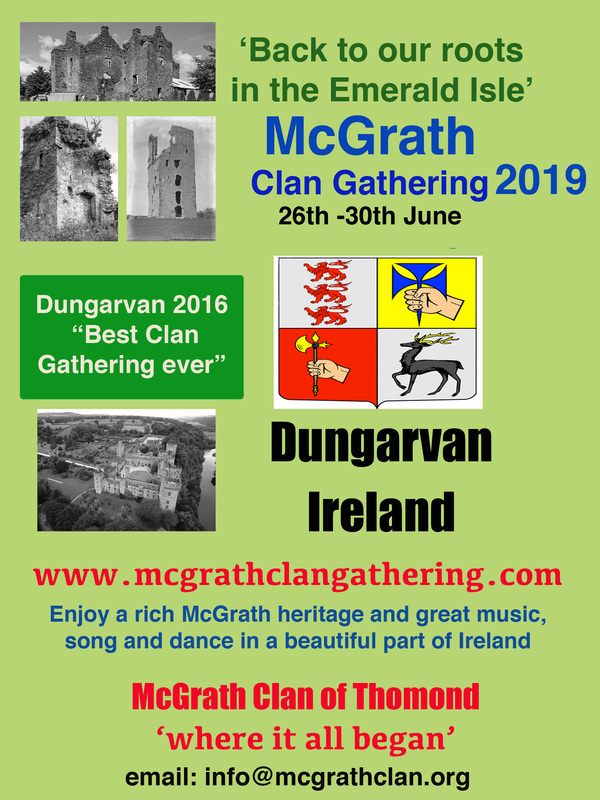 There is just little over three weeks to the McGrath Clan Gathering in Dungarvan. Interest in the Clan Gathering has risen over the past few weeks and the excitement about the up coming event is growing. We had e confirmed visitors from USA, Canada, UK, SA and various parts of Ireland. As the final plans are been made, the schedule is available on http://www.mcgrathclangathering.com. There are two possible changes, the location of the Saturday morning talk may be changed. As John Cunningham will be speaking, we may need to move to a bigger venue. In the event of bad weather on Sunday afternoon, John Young will give a talk instead of the planned walk. As stated above, the key note speaker on Saturday morning is John Cunningham, who will give a talk on “The McGraths of Donegal and Fermanagh and their association with Lough Derg’, in which he’ll outline the history of the Clan McGrath of Ulster. John’s work is regularly referred to in talks about the McGrath’s. Other speaker include William Fraher, who will speak on Castles of the McGrath’s, Dan McGrath on ‘McGrath’s at the top table of Sport’. There will also be a talk about Genealogy on Saturday morning. We will be presenting two ‘Medals of Honour’ to two people who have brought great honor to the McGrath name. These will be presented at the Clan Dinner in Clonea Strand Hotel on Saturday night. There is a possibility of a very famous McGrath making a visit to the event but this hasn’t been confirmed. We are delighted that Para Olympic Bronze medalist Seanie McGrath will not only be visiting the event but will also be speaking about his life. Polo shirts need to be ordered before the end of May, just drop an email to danmcgrathmedia@gmail.com with the sizes. Please state size in inches. If you wish to take part in the Golf, please let us know asap, and let us know if you need to rent clubs. Some things you may not have known about the McGrath name, there is a McGrath Airport, there is McGrath Ale and they were the poets/scribes for the O’Briens. The mother of the famous Clancy Brothers was also a McGrath. Contact 00 353 86 4072527 for more information or to book tickets for any of the events. This entry was posted in Uncategorized on May 20, 2013 by McGrath Clan (official).